"Today I also wish to mention this years Message for World Communications Day which was released on the eve of the Feast of Saint Francis de Sales, Patron Saint of Journalists. The Message concerns the new technologies which have made the internet a resource of utmost importance, especially for the so-called digital generation. Undoubtedly, wise use of communications technology enables communities to be formed in ways that promote the search for the true, the good and the beautiful, transcending geographical boundaries and ethnic divisions. 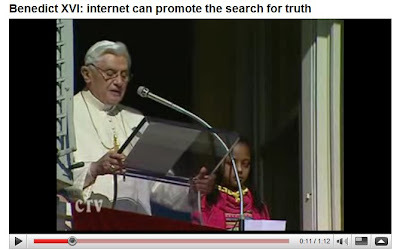 To this end, the Vatican has launched a new initiative which will make information and news from the Holy See more readily accessible on the world wide web. It is my hope that this initiative will enrich a wide range of people including those who have yet to find a response to their spiritual yearning through the knowledge and love of Jesus Christ whose message of Good News the Church bears to the ends of the earth (cf. Mt 28:20)!"